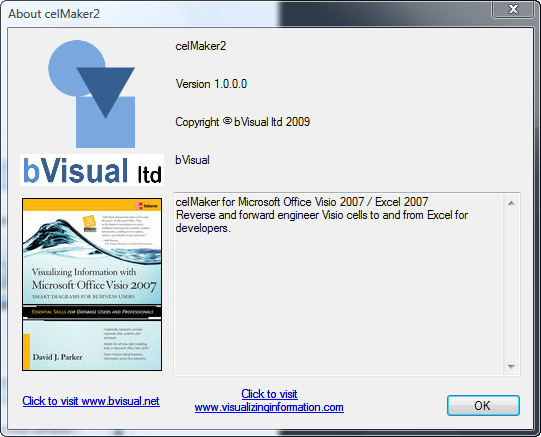 I was recently asked to provide a new version of celMaker that works with Visio 2007 and Excel 2007, so I got my old VB6 code out of SourceSafe and upgraded it so that I could run it on my Vista 64 laptop too. I also decided that I would release this version to the public as freeware because I have added no new features.So, what is celMaker? And where can you download it? Most Visio users will have the components, so you can just click the Launch link. 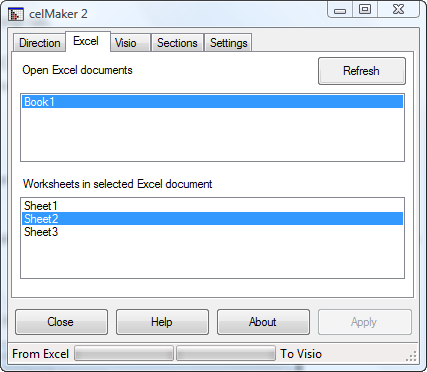 celMaker is a developer(ish) tool for Visio which allows the most often used sections of a Visio ShapeSheet to be copied into an Excel spreadsheet, or from an Excel spreadsheet onto a Visio master. 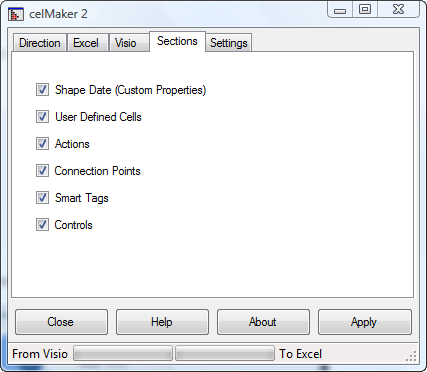 This means that the Visio Shape designer can create one master with its Shape Data (nee Custom Properties), User Cells, Actions, Smart Tags, Controls and Connection Points, and then save this to an Excel spreadsheet for backup, verification, discussions, documentation or transfer to another Master. 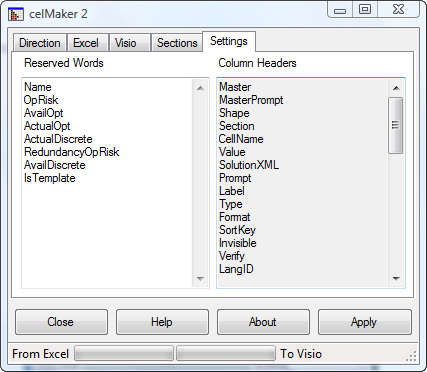 The Excel spreadsheet can be created manually or by reverse engineering existing Visio masters. 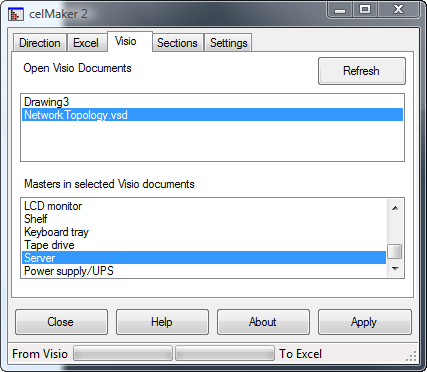 celMaker is provided as a stand alone executable that requires both Visio and Excel to be running, and can be used for many different types of diagram projects. 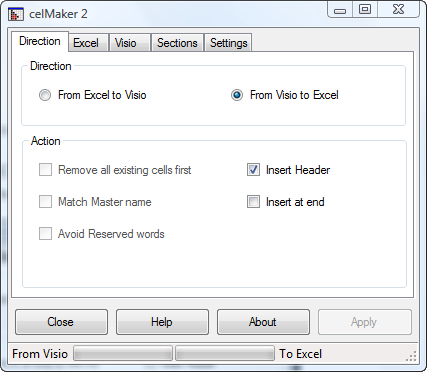 This will forward engineer a suitable Excel worksheet to selected Visio Masters. 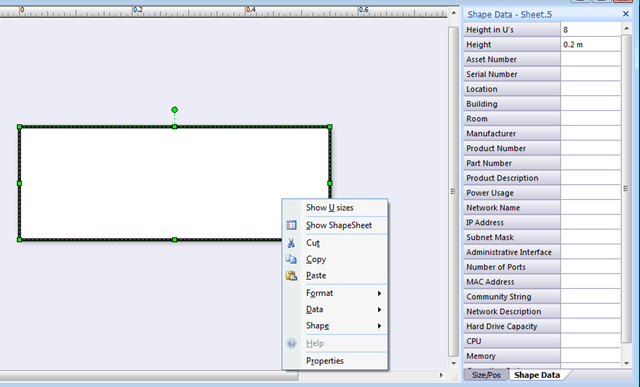 If checked, will remove all cells for the selected ShapeSheet sections on the master, before adding any. If checked, will only process changes from the spreadsheet to the master if the master names match. You can edit this list on the Settings tab. 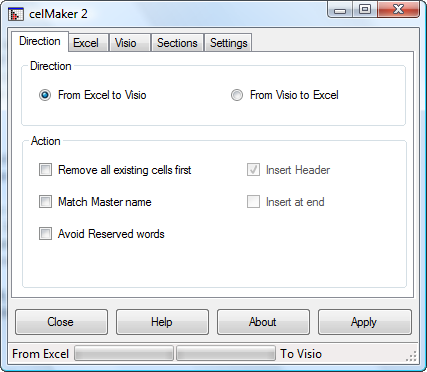 This will reverse engineer selected Visio Masters into a formatted Excel worksheet. If checked, will create the headers row in the Excel spreadsheet. If checked, will preserve any existing rows in the selected Excel spreadsheet, by adding new ones at the end. Select an open Excel workbook (document) from the upper list box, and then the worksheets will be listed in the lower one. Select a single worksheet in the lower list box. 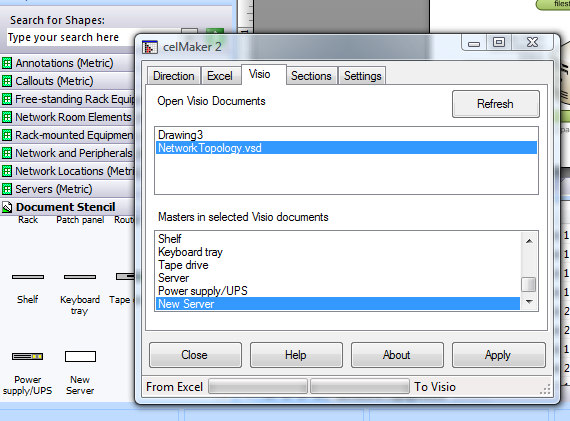 The Open Visio Documents panel only lists editable documents. If you want to copy from a Master on a read-only stencil, then just drag and drop it onto an editable document. Select an open Visio document in the upper list box, then its Masters will be listed in the lower one. You must select one or more Visio Masters of an open Visio document. This tab allows the required sections to be selected for forward or reverse engineering. This tab enables you to edit the reserved words or check the column headers. Opens the About dialog (and a shameless plug for my book!). The Apply button becomes enabled when you have selected both an Excel worksheet and a Visio Master. If the Direction select is Visio to Excel, then you will be prompted to confirm the copy operation. You need to select an editable Master to copy the cells to from a worksheet. You will be prompted to continue. 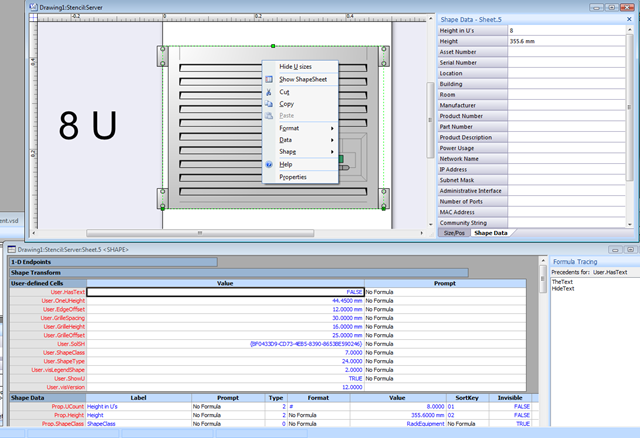 After processing, the Master will have all of the ShapeSheet sections that you have in your worksheet. 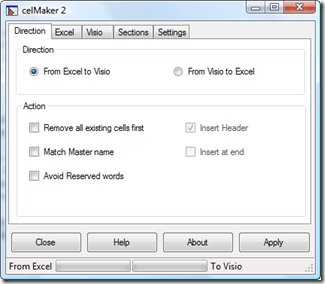 If you reverse engineer Visio cells to Excel then a row will be created in the worksheet for every cell in Visio. The source Master and Master prompt will be listed in the first two columns, with the Section and Cell name or number in the third and fourth columns. The hidden name of the cell. Any default value for the property or for the user-defined cell, for example. 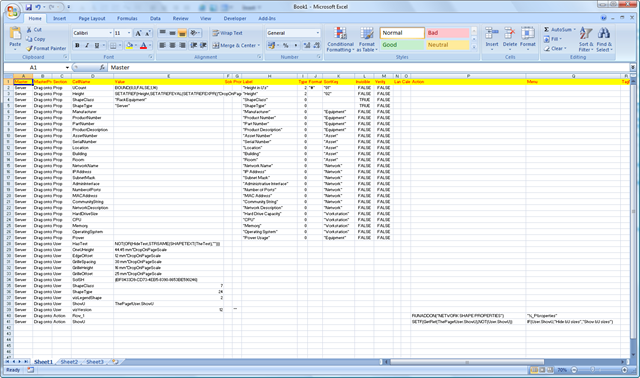 The displayed name of the property or user-defined cell. Must be a valid format for the Type. For example, if Type = 1 or 4, then the Format should be a semi-colon separated list. Default is 0. Must be, or evaluate to, 1 or 0, which will prompt or not for the property when a new master instance is created. Default is 0. The action to do, expressed as a valid ShapeSheet formula. The displayed menu text for the action. Must be, or evaluate to, 1 or 0, which will check or uncheck the menu item. Default is 0. Must be, or evaluate to, 1 or 0, which will enable or disable the menu item. Default is 0. Must be 0 = left, 1 = center, or 2 = right. See Microsoft Office Visio 2007 SDK Documentation for more information on these elements. Once you have finished an operation, you will be prompted to close celMaker, or not.